While I’m as forward thinking as the next guy, it seems to me there is just too much going on in The Gluten-Free Vegetarian Family Cookbook (Da Capo/Lifelong). If I’m very honest (and I know I will likely get rocks thrown at me for saying this) I don’t even really believe that it’s possible that as many people are gluten intolerant as say they are. No matter what the cost, it seems, these days people seem to be determined to be special, in this way if not that one. That said if you happen to be part of that small minority who does, in fact, have a gluten sensitivity and you are also a vegetarian. Who has a family. Then Susan O’Brien’s latest is for you. By the way, this is not O’Brien’s first gluten-free, vegetarian rodeo. She is also the author of Gluten Free, Sugar Free Cooking, The Gluten Free Vegan and Gluten Free Vegan Comfort Food, so clearly this is a topic she knows better than most. O’Brien’s own focus is on vegan foods, and The Gluten-Free Vegetarian Family Cookbook definitely leans that way. However, there are several vegetarian recipes, though even some of those include instructions for doing them up vegan. A dark and twisted psychological tale that will keep readers guessing, perfect for fans of I Hunt Killers and Gone Girl. When Preston wants his own cover story to go visit a girl he met online, Max doesn’t think twice about it. But then Preston never comes home. And the evidence starts to pile up -- terrifying clues that lead to Preston’s body. What is copyright? How does licensing on the web work? How can you make it work for you? Copyright is your tool. Do you know how to use it? Many of us create copyright all the time, mostly without even knowing it, and use other people’s copyright every day. Whether it's taking a photo on your phone or uploading a video to your vlog, you have created copyright. Copyright describes both the creative work you have made and the law that protects that work. You can use this site to explore more about your rights and the rights of others, plus details of where to find out more. Because the site was created by the BBC, the content and resources here relates specifically to UK copyright. But even those not in the United Kingdom will find much of interest here. A great starting off point on a conversation that’s being had around the world. You can find “Copyright Aware” here. It’s the summer of 1967 and all Liam Sol wants is to ride the perfect wave and to sleep with the prettiest girls. But when his father’s murdered body is found washed ashore, his carefree life comes crashing down on him. A prime suspect mysteriously dies in police custody and Liam leaves behind his life as a surfer and launches his own investigation into his father’s death -- against the warnings of the police and his family. But the killings have only just begun, and Liam soon finds himself being hunted by both the killer and the police, who suspect he is a cold-blooded murderer. Liam’s pursuit to find his father’s killer will lead him to a violent showdown and a shocking discovery. One that will shake Liam’s faith to its core. 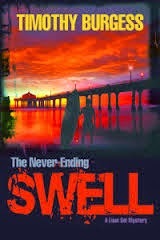 From the pure waters of the Pacific Ocean to the dark depths of the human soul, The Never-Ending Swell is a pulse pounding mystery. [Bruce] Willis will make his Broadway debut opposite stage veteran Elizabeth Marvel (Other Desert Cities, House of Cards) in the play written by two-time Academy Award winner William Goldman (The Princess Bride, Butch Cassidy and the Sundance Kid), who also wrote the screenplay for the 1990 Rob Reiner film that starred Kathy Bates in her Oscar-winning turn as Annie Wilkes. Willis will play the housebound romance novelist Paul Sheldon, who becomes a prisoner of his unhinged "Number One Fan" Wilkes (Marvel) after she rescues him from a car accident and learns that he plans to kill off her favorite fictional character. Will Frears (Omnium Gatherum) has signed on to direct the play, which is scheduled for a limited run in the fall at a theater to be announced. 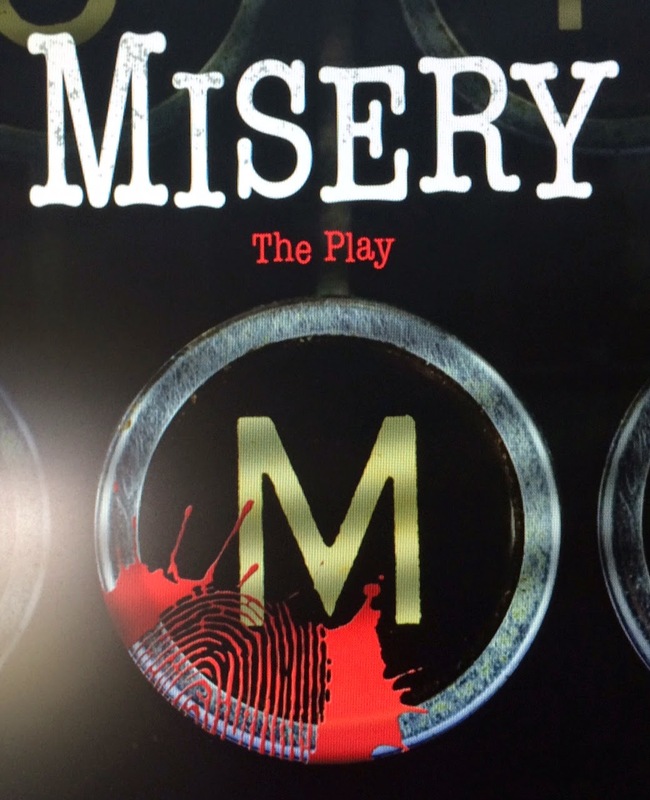 Misery will be produced by Warner Bros. Theatre Ventures' Mark Kaufman and Castle Rock Entertainment's Martin Shafer and Liz Glotzer. Raymond Wu also is producing. The play is scheduled for a limited run this fall. You want tickets? You’ll be able to order them from the play’s web site here. Publisher HarperCollins, planning for a hit, will print two million copies for the book's July 14 publication date, a spokeswoman tells PEOPLE. HarperCollins president Michael Morrison says the book jacket was meant to evoke Mockingbird's now-iconic look: "It draws on the style of the decade the book was written." You can see the full piece here. 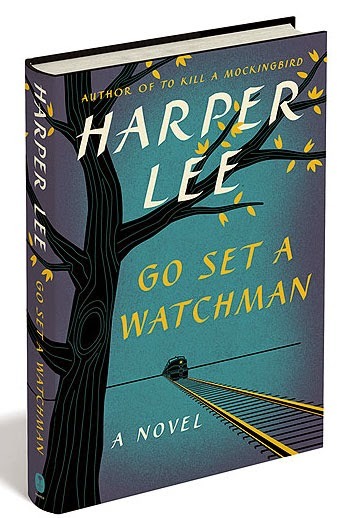 We’ve previously written about Go Set a Watchman here and here. Clean Reader prevents swear words in books from being displayed on your screen. You decide how clean your books should appear and Clean Reader does the rest. A Harry Potter-style broom icon is engaged to clean the crap (sorry) right out of the e-book you are reading. It leaves behind nothing beyond a little gap and some dots where the offending letters were previously located. And how clean is clean? The “Clean” setting only blocks major swear words from display. This includes all uses of the F-word we could find. The “Cleaner” setting blocks everything that “Clean” blocks plus more. “Squeaky Clean” is the most restrictive setting and will block the most profanity from a book including some hurtful racial terms. Aside from the fact that all of this stuff is pretty subjective (What is “hurtful”? What is “profanity”? What is “clean”?) how can anyone think that altering the text of a book in this way is a good thing? One of the things I do is write novels. When I choose a word, I do so for a reason. I’ve chosen it for the way it fits in with the other words on the page. How it enhances the meaning of those other words and how it sounds in the mind when you read it. Are you offended by my word choice? Maybe sometimes. But it’s a bit world. And there are a lot of books in it. Go read one of those. When I get a salad at a restaurant and the chef thinks the salad is best served with blue cheese on it, I will spend a significant amount of time trying to find and remove every piece of blue cheese. Then I’m able to enjoy the salad. In the restaurant world the chef is the artist. He has spent his entire professional life trying to create masterful pieces of art to be served on a dish or in a bowl. Is the chef offended when I don’t eat the blue cheese? Perhaps. Do I care? Nope. I payed [sic] good money for the food and if I want to consume only part of it then I have that right. Everyone else at the table can consume their food however they want. Me removing the blue cheese from my salad doesn’t impact anyone else at the table. We’ve discussed this with several lawyers and they have all agreed that Clean Reader does not violate copyright law because it doesn’t make changes to the file containing the book. All Clean Reader does is change the way the content is displayed on the screen. The user has the option of turning off the profanity filtering tool if desired. No changes are made to the original book the user downloads when they buy a book. It’s also worth pausing, however, to note that ebooks have once again shifted the balance. No longer does an author necessarily have the option of signing off on altered editions -- at least if the alteration is merely a filter applied to the original book. Once we had to wait until books left copyright -- long after they'd become fixtures in literary and cultural history -- before we could play freely with their stories. Now, we can read a book that came out yesterday in a form as heavily edited as the recently sanitized edition of the classic Huck Finn. Perhaps this is all meaningless. After all, the changes aren’t “real.” But it’s worth wondering what this newly unstable sense of reality means for readers. The Clean Reader app is free. Downloading sweepable books, however, is not. Loved and admired by generations of children, the fictional child Eloise had a creative and loving birth, but a difficult childhood, as seen in a new documentary slated to be aired on HBO March 23rd. 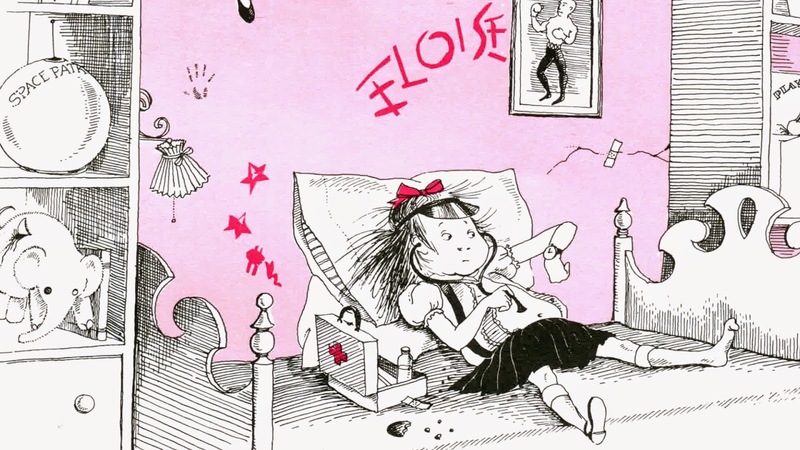 Though Eloise’s charming face is known by many, few know -- or paid attention to -- the drama that occurred behind the scenes while the Eloise franchise grew in popularity a few years after the debut of the first book, Eloise: A Book for Precocious Grown-ups, in 1955. The character of Eloise, the little girl who lives alone in the Plaza Hotel in New York, was created by singer/performer Kay Thompson and brought to visual life by the pen of Hilary Knight. But Knight and Thompson would end up in outs, and Knight has for many years been restricted from illustrating the character he so charmingly co-created. All of this is explained in It’s Me, Hilary: the Man Who Drew Eloise, a documentary form portrait of Hilary Knight, an artist in some ways stunted by early success and haunted by his own failures while remaining devoted to his most famous creation. 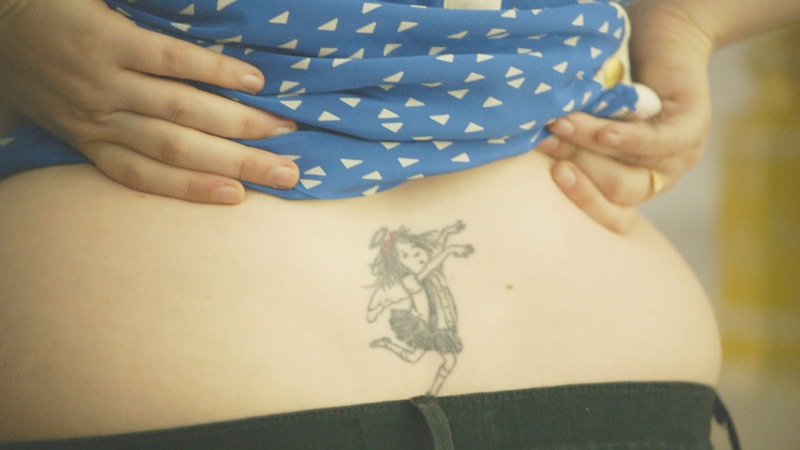 Interestingly enough, the documentary came to be because, as explained in It’s Me, Hilary, a friend told Knight that Lena Dunham (Girls) had an Eloise tattoo (shown at left). Knight created a special drawing for Dunham that acted as a sort of introductory bouquet and the two have been fast friends since. Dunham acts as narrator here as well as executive producer. 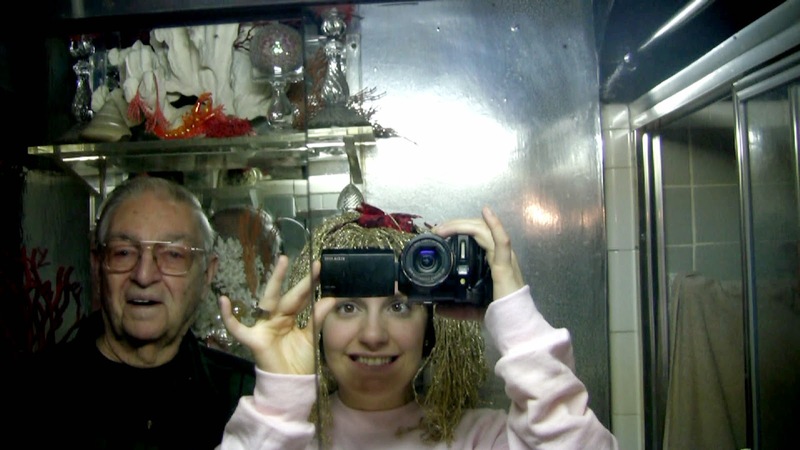 The resulting portrait is honest, affectionate and truly entertaining. The documentary debuts March 23rd on HBO, with other playdates happening into April. Well, add the apparent ability to time travel to the long list of things at which Sherlock Holmes (Benedict Cumberbatch) is generally unmatched. Steven Moffat, co-creator of Sherlock, confirmed today to EW that the series’ anticipated Christmas special will be set in Victorian England, just ahead of the Sherlock SXSW conference. Details about the episode are scant, but we can now assume it will involve Holmes and Watson (Martin Freeman) investigating a major crime in the 19th century. The fourth season of Sherlock is also currently filming and will likely premiere around the same time as the Christmas special. 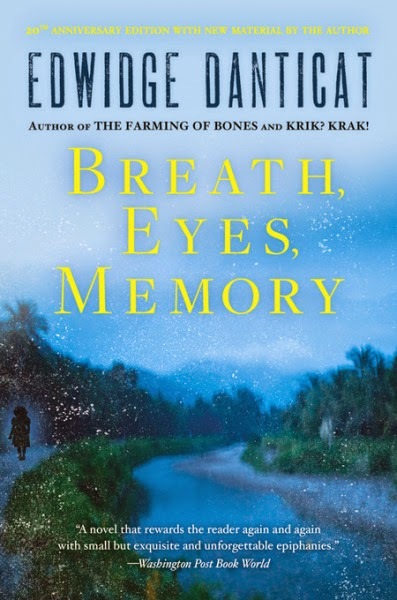 Breath, Eyes, Memory was Haitian American author Edwidge Danticat’s debut, the book that made readers and reviewers instantly sit up and pay attention: here was a writer to watch out for. Published in 1994, it is the story of Sophie Caco as we follow her from her native Haiti at 12 to the inevitable culture shock that New York City will be. The 20th anniversary edition from Soho Press includes an essay about the book by the author as well as an interview with her. The insights Danticat provides in both forums add a depth to an already wonderful book. The cause was posterior cortical atrophy, a rare form of dementia, Suzanne Bridson, an editor at Transworld Publishers, said in an email. An accomplished satirist with a penchant for sending up cultural and political tomfoolery, Mr. Pratchett created wildly imaginative alternative realities to reflect on a world more familiar to readers as actual reality. 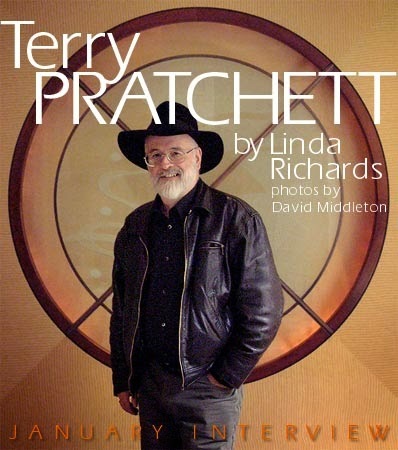 January Magazine interviewed Pratchett in 1997 and 2002. For many who admired Pratchett’s special brand of magical realism, with his loss, the master has moved on. Good night, Sir Terry. We’re late to the party. Flavor creator Sensient predicted their top flavors for the year a while ago, but thanks to Natural Products Expo in Anaheim last week, they've come under our radar now. Wisconsin-based Sensient is a leading global manufacturer and marketer of colors, flavors and fragrances. They’re pretty much in the business of knowing what is going to hit next. After all, long before it gets anywhere neat the market, Sensient has every flavor and color imaginable in giant cauldrons awaiting action. It makes sense that they’d be keeping close watch on what way the wind blows. So how is the wind blowing for 2015? 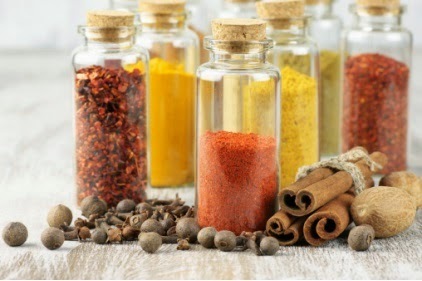 Sensient predicts eight flavors that range from warm, familiar and comfortable to exotic and new. Here is their list of the top trends in flavors for this year. Ask yourself this, you outlaw bohemians who view the suburban cul-de-sac at the end of the bourgeois rainbow as a fate worse than death: If you planned to chuck it all to avoid having to endure an undistinguished life; if you wished to live large and make a last-ditch statement of your existence, then check out with some Bonnie and Clyde panache (didn’t they die pretty -- at least in the 1967 film? ), what would you do? You would live dangerously in order to acquire material for a novel, write it, party until your money ran out, then dress up as a skeleton and overdose on sleeping pills on a prominent float in Florida’s Key West Fantasy Fest parade, right? Now that’s a bang worth hearing. 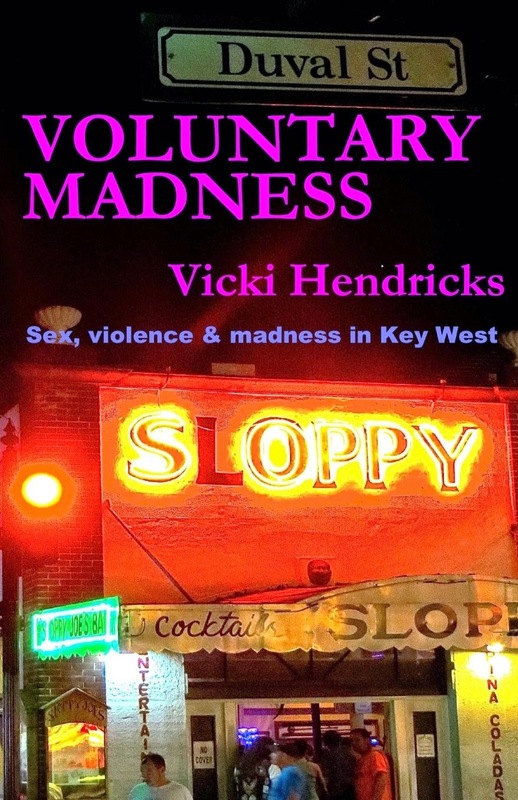 It also happens to be the game plan for Punch, an older, half-Jamaican, half-Italian half-hearted desperado, and Juliette, a desultory 20-something waitress at a Tennessee Cracker Barrel, the main players in Vicki Hendricks’ much-missed and thankfully reissued, 2000 novel, Voluntary Madness (New Pulp Press). These star-crossed but well-suited lovers -- partners in crime and co-dependence -- stumble upon each other in a white-trash version of what Hollywood used to call a “meet cute.” Juliette wanders into the 7-Eleven that Punch was about to rob and is immediately smitten by “his hard muscles, with the smoothest Kahlua and cream skin, thick black hair past his shoulders, a view of the world evolved past our time -- I’m his, body and soul, no regrets, till I die …” This is a love story of two people who need unconditional love, without any kind of foreplay or background check. The dating scene was a lot more fun before the advent of Match.com, for sure. Punch is a deadbeat with a sense of adventure, and in Juliette’s eyes he’s a man of the world. He’s played guitar in a band, troubadoured around Europe, knows how to order food at fancy restaurants, and possesses enough world-weary je regrette rien to make her swoon and substitute his beloved rum for a curative cup of hemlock. An affable opportunist who is also sincere, Punch tells her that she saved his life, and dedicates himself to her as much as her modest inheritance and his dissolute ways will allow. The only sin Punch acknowledges is the sin of being ordinary, and this borders on the nihilistic, giving weight to his suicidal endgame. “Nothing’s right or wrong, good or bad. Just more or less interesting,” he says. In the “you complete me department,” Punch provides what Juliette lacks. 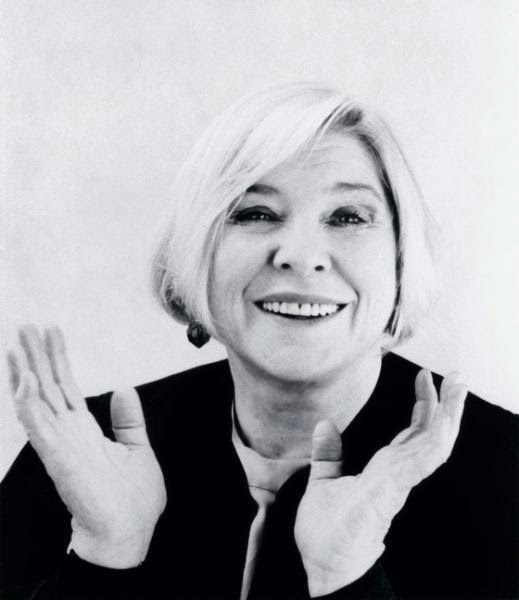 “ … I always wanted to be a writer. We read about Hemingway in high school, and I’d be an adventure-novelist myself, if I had the brains -- which I don’t. I know my limitations. So being with Punch is the next best thing, the only thing for me.” Juliette possesses what Punch walked into the 7-Eleven for in the first place, money -- and lucky for him, also the instant compassion of a needy person. Juliette brings more to the relationship than complacency and care-giving; and if their first meeting doesn’t limn her as a chance-taker, one of her private pleasures is to wander Key West at odd hours and “flash” passersby. Punch, on the other hand, is a diabetic and a little less mobile, and seems weary of the day-to-day. He’d rather spend his time slouched on a bar stool than writing his much-vaunted but unseen novel, which he musters the courage to do when Juliette gently prods him. Aside from being Punch’s sweet-natured taskmaster, Juliette is also his muse. “I don’t interfere with his art,” she says, “I just set up interesting situations to stimulate it.” But what this pair are really doing is living their lives on their terms; and as Juliette’s inheritance dwindles the situations become more interesting. They soon realize that armed robbery, another form of experience for the book, could also be a way to solve their cash-flow dilemma and spice things up a bit. First, they break into Key West’s Ernest Hemingway House & Museum, intent on theft. While there, Punch raises the ante to the house limit when he strikes and kills an elderly security guard. Free from compunction for lesser crimes, they then work their way up to robbing restaurants for food, and ultimately emptying the pockets of patrons at the fancier restaurants in town. The press covers their exploits and they gain some renown and a reputation to uphold. Juliette is willing to follow her partner to the end, though she carries the hope that he can be rehabilitated. “But if Punch writes his great American Novel,” she muses, “I’m figuring he’ll want to live. He’ll be happy forever and won’t have to drink himself into a coma anymore.” Yet this outcome is not to be. You’ve heard to it referred to as the Caveman Diet. And, no: you don’t eat cave men. Rather, at its simplest, on the Caveman Diet you don’t eat things that would have been available to prehistoric humans, avoiding foods like dairy products, grains, legumes, processed oils and refined sugars. Plus you eat meat. A lot of meat. No vegetarians need apply. The goal is to lose weight, increase energy levels and detoxify the system. This is not the place for those who choose diets for ethical reasons. Results are the thing. Results that are sleek and firm and strong. Full stop. 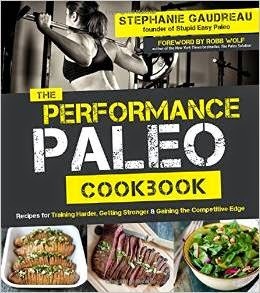 In The Performance Paleo Cookbook (Page Street), author Stephanie Gaudreau takes all of this to new levels. This is not Paleolithic Diet 101. Rather Gaudreau’s book focuses on using food as fuel to bring your personal machine to whole new performance levels. For a first take on high performance eating, you could take a run at a book Gaudreau co-wrote in 2014: The Paleo Athlete: A Beginner’s Guide to Real Food for Performance. Nor was she even then a newcomer to the Paleo diet. Her web site, Stupid Easy Paleo has been running hard since 2011 (ancient history in the Paleo diet world). Gaudreau’s mandate with the book is very similar to that of the web site: simple, easy-to-follow recipes that “stay true to the roots of Paleo” along with great resources for a paleo lifestyle. Gaudreau knows her stuff and it shows. The Performance Paleo Cookbook is filled with nutrient-dense recipes you are unlikely to find anywhere else. Imagine Blueberry Pork Patties. Curried Lotus Chips. A Swiss Chard Salad that is beyond belief and a whole lot of desserts that will put wanna-be cave people into dinosaur heaven. Driven to madness by the abduction of his son, King Elias declares war on Andaryon. Sullyan knows the Andaryans are blameless, still reeling from the abduction of their own prince and the subsequent collapse of the Hierarch, but Elias will not listen to reason. While he gathers his forces to march through the Veils, the real conspirators remain free to wreak havoc on both sides of the conflict. Branded a traitor by her king, and with the rift between her and Robin widening, Sullyan embarks on a perilous search for the missing princes. Bloodshed is inevitable and innocent lives will be lost, but the war must be stopped. If she fails, it will mean death for both princes and disaster for the Five Realms. “Cas Peace’s Artesans of Albia trilogy immediately sweeps you away: the drama starts with King’s Envoy, continues unabated in King’s Champion, and climaxes in King’s Artesan, yet each volume is complete, satisfying. The Artesan series propels you into a world so deftly written that you see, feel, touch, and even smell each twist and turn. These nesting novels are evocative, hauntingly real. Smart. Powerful. Compelling. The trilogy teems with finely drawn characters, heroes and villains and societies worth knowing; with stories so organic and yet iconic you know you've found another home -- in Albia. 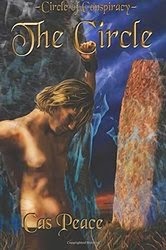 Now there’s ... Peace’s forthcoming sub-series, the Circle of Conspiracy trilogy, proof of more Albian tales on the way. So start reading now. I, for one, can’t wait to find out what will happen next.” -- Janet E. Morris: author of The Sacred Band of Stepsons series; the Dream Dancer series; I, the Sun; Outpassage. Authors should write a literary version for publication in print form, and a racier “good-bad” version for those who use e-readers such as the Kindle. 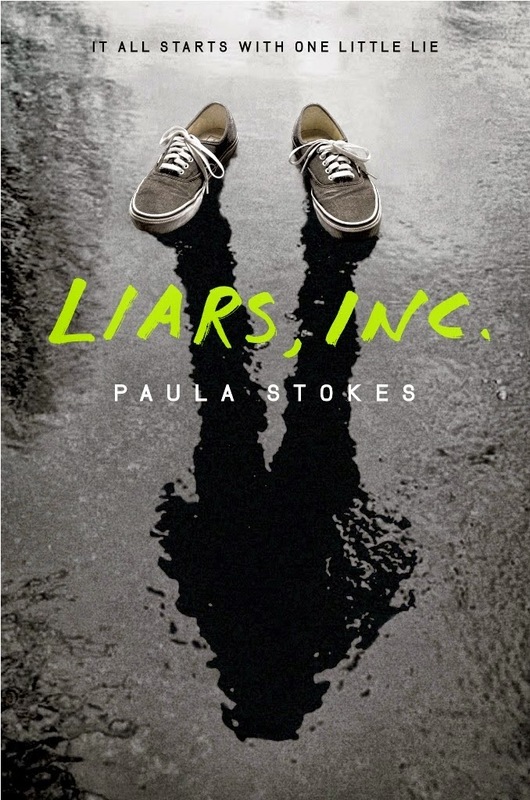 Weldon revealed she had considered expanding a recent e-book novella for print. A European research network studying the effects of digital text reading said “research shows that the amount of time spent reading long-form texts is in decline, and due to digitisation, reading is becoming more intermittent and fragmented”. Penn Gwinn wasn’t interested in another assignment. But his curiosity is piqued when his Control Agent mentions one of his best friends, as well as the mysterious coins known as Universeros. The pursuit of the Universeros takes Penn through the desert of Northern Mexico and the jungles of South America, one step ahead of ODESSA -- an international Nazi network set up to facilitate secret escape routes for SS officers, as well as across the U. S. Mexico border, where he becomes enmeshed in skirmishes between the Minutemen and the ACLU. 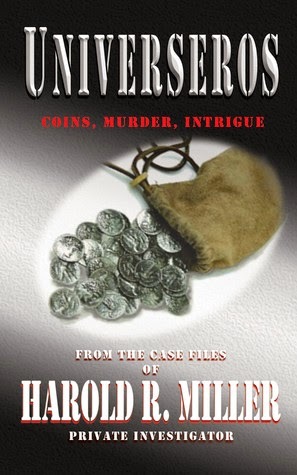 As libidinous red-haired women and duplicitous conspirators attempt to confound him, exposing the darker side of those he considered friends, the stakes get higher: the mysterious coins... and murder. Whether or not your city or even country participates (yet!) today is World Book Day. If your community is part of it, go out and play. If not? Maybe you’re just as lucky: you can feel justified in grabbing some extra “me” time to read a book! Didn’t get enough time to plan? Don’t despair: the UN’s World Book and Copyright Day is coming up on April 23rd. Irina Bokova, director general of the UN says, “Our goal is clear -- to encourage authors and artists and to ensure that more women and men benefit from literacy and accessible formats, because books are our most powerful forces of poverty eradication and peace building.” You can get more information here. Does Harrison Ford’s Participation in Blade Runner Sequel Confirm Deckard is NOT a Replicant? Harrison Ford is officially returning as Rick Deckard in the sequel to Alcon Entertainment’s Blade Runner with Academy Award nominated director Denis Villeneuve (Prisoners, Enemy) in talks to direct. Last we heard about the film Ridley Scott, who directed the original 1982 film and will produce the sequel, confirmed earlier reports that Ford was interested in the script and said the film would shoot this year. Turns out Scott was optimistic. Ford will return, but production is not slated for early 2016. Before that, Ford will be seen in The Age of Adaline and the much anticipated upcoming Star Wars: Episode Seven. Fans are talking, though: does Ford’s participation as a much older Deckard confirm that the character was not a replicant? We’re undecided. For information on adding a link to the Author List, click here.